Mindy (Dorman) Cohen had a Reunion on Sunday, July 19, 2015. 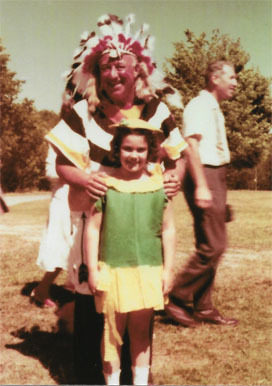 This happens to be the 75th Anniversary of the creation of Camp TARIGO. Check out the FACEBOOK TARIGO Group for more details. A New GUESTBOOK has been created for 2014, but it is now full. I think it makes more sense to leave messages on FACEBOOK. they are now archived below. 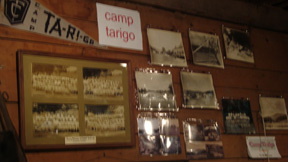 There is also a FACEBOOK GROUP for TARIGO campers, who were at camp in the 1970's. The archived previous Guestbooks are also available further down on this page. to read the previous GUESTBOOKS from 1997-2013. You can use GOOGLE to search this site. Type in "camp tarigo" and then the name of the person you are seeking. 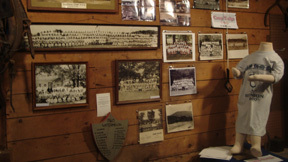 This is the homepage for the memories of the former Camp TA-RI-GO, which was located up the hill on Little Red Kill Road in Fleischmanns, New York, in the Catskill Mountains off Route 28. 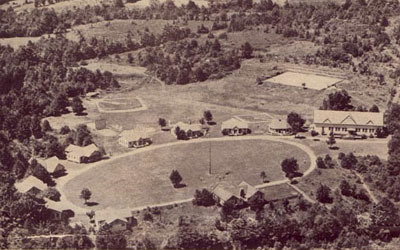 It was a Jewish summer camp for several hundred boys and girls from before World War II until 1977. CLICK ON THE BUTTONS BELOW TO SEE THE VARIOUS PAGES ON OUR WEBSITE! 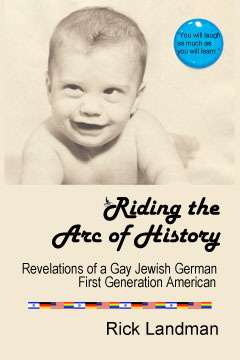 Story of a Short Gay Camper, by Rick Landman. You can use GOOGLE to search this site. Type in "camp tarigo" and then the name of the person you are seeking. You can also bring some of your old photographs and artifacts to donate to their exhibit. The Fleischmanns Museum of Memories is located on Main Street, behind the Skene Memorial Library. It's phone number is: Phone: (845) 254-5311 and you can contact them by emailing dekmm@aol.com. The are not open on a regular basis, so contact them to get their exact hours during the summer. 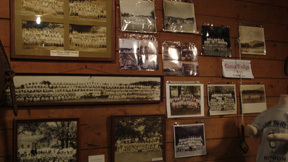 These pictures were taken from the permanent exhibit at the Museum dedicated to CAMP TA-RI-GO. OVER 250 PEOPLE ATTENDED in 2000! 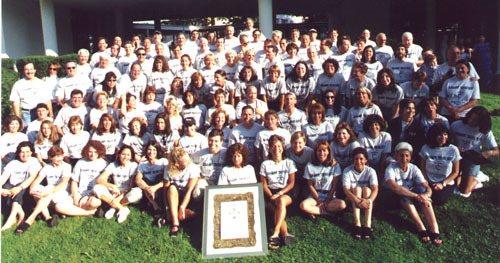 Click on the "Reunion 2000" Button directly below for all the details and photos of the first Reunion in 2000. Click here if you want to see a larger group photo. SECOND REUNION - August 19-21, 2005 at the NEVELE. Click on the "Reunion 2005" Button directly below for all the details and photos of the Second Reunion in 2005. This is a picture of most of the campers who were there on Saturday. Missing are the group that made a pilgrimage back to Fleischmanns. They didn't get back in time for the pictures. 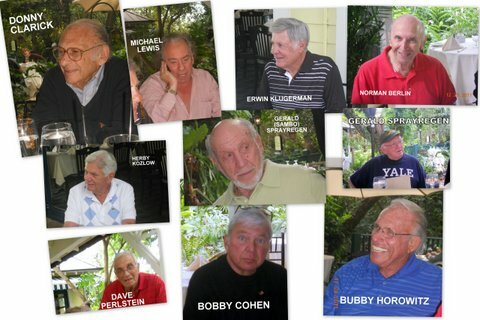 Click here to read the Monologue that was given by Rick Landman at the Reunion. 2012 MINI-REUNION of "Super Seniors"
Group photo of Mini Reunion. WHAT BEGAN AS A WELCOME TO FLORIDA LUNCH FOR THREE OF US, TURNED INTO THE FIRST ANNUAL REUNION OF 10 TARIGOITES, CIRCA 1940'S AND 1950'S. FOR THESE "GENTLEMEN OF A CERTAIN AGE", WHO OFTEN HAVE DIFFICULTY REMEMBERING WHAT HAPPENED YESTERDAY, IT WAS QUITE REMARKABLE HOW WE SPENT OVER FOUR HOURS REMEMBERING THE MOST MINUTE DETAILS FROM BACK THEN. THE EVENT, WHICH WE AGREED WOULD BECOME AN ANNUAL GATHERING, HAD US "ANCIENTS" TALKING ABOUT PEOPLE AND STORIES FROM 60+ YEARS AGO, AS IF THEY HAD JUST HAPPENED. Click on OLD PHOTOS on the table above. 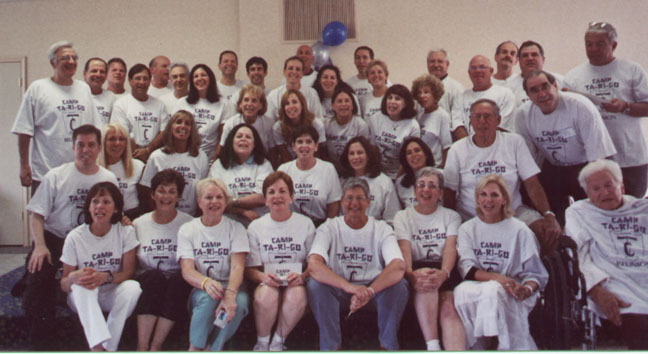 Below are some photos of the camp from 1996. To see more 1996 photos just go up to the table above, and Click on the "1996 PHOTOS" botton. 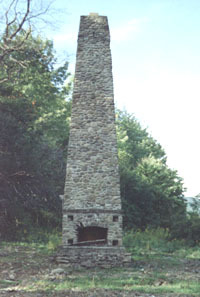 This fireplace from the Rec Hall is all that is left of the camp structures. The campgrounds were demolished in phases to build a condominium complex of single family houses on what is now called Tarigo Road. The last building to the destroyed was the Rec Hall, which was totally demolished in 1996. The lake in 1996 (no island) and in the 1960's below. by Rick Landman... CLICK HERE!